Our look back at the marvellous royal hats worn at the wedding of the Duke and Duchess of Cambridge four years ago now moves from family members to royal guests. First up is hats worn by guests from the reigning royal houses of Europe. The Norwegian Royals (who are cousins to the British Royal family) were represented by the King and Queen. Queen Sonja thoughtfully turned to British hat makers Lock and Co. for her hat. In white straw and trimmed with a simple curled white feather, the ceterpiece of this hat was its lattice brim which was folded up over the crown. The resulting shape was a modern departure for Sonja but it looked wonderful on her. Queen Margrethe of Denmark topped her Twitter blue wool coat with a brimless calot hat covered in the same fabric. The calot was trimmed in a band of the same patterned blue silk fabric as her dress over which several spiky, spiralled feathers were placed. The hat is a characteristically quirky piece for Margrethe and I thought she wore it well. The overall ensemble, however, was an overkill of the same blue fabric and needed breaks in both colour and texture. Grand Duchess Maria Teresa topped her slate blue dress and jacket with a large dove grey picture hat trimmed with a single, oversize blue ombre rose. The hat is a beautiful one and while I covet it for my own millinery closet, I don’t think it was the right choice for Maria Teresa. Both her suit and the hat seemed to dwarf the Grand Duchess, which was most unfortunate. The Spanish Royals seldom wear hats and this wedding provided us an opportunity to see their millinery style. Queen Sofia chose a light fascinator to in the same shade as her Margarita Nuez lavender silk suit. Made of layered organza and net tulle, the headpiece was studded with the same periwinkle blossoms that formed the floral pompom buttons on her jacket. The Princess of Asturias (as was her title then) topped her Felipe Varela embroidered pink 1930s inspired dress with a coordinating cloche hat. Designed by Pablo Y Mayaya, the cloche hat was a great scale and colour for Letizia. I’m afraid, however, it suffered from over-trimming. With four kinds of feathers (including large pheasant ones). a wide ruched sash around the crowd, a net tulle veil, rosettes and even bits of appliqué lace, this small hat held everything but the kitchen sink and suffered for it. Princess Máxima (who was not yet Queen) was the picture of refined elegance in a pale pink lace Valentino suit and a silk calot hat designed by Fabienne Delvigne. Head-to-toe ensembles in pale pink risk looking rather boring and flat but the different textures of lace and draped silk created a look that was as interesting as it was harmonious. The artfully ruched silk on the hat gave it a wonderful sense of movement despite its small footprint. The addition of diamond star brooches to the side of the calot gave it a touch of glamour and we now all associate with Máxima and I adore her for adding this bling. Princess Mathilde (who also was not yet Queen) chose teal blue for her ensemble. Her Armani dress and jacket was crowned with a large picture hat by Philip Treacy. A similar shape to the navy hat worn by Lady Frederick Windsor, this piece featured a wide round brim, moulded crown and vertical looped Treacy signature bow. While I loved the colour on Mathilde, the impact of the wonderful hat was lost against her overly shiny suit. Crown Princess Victoria followed the pattern of head-to-toe in a single colour, choosing cantaloupe orange for her ensemble. Her large straw picture hat, designed by Swedish milliner Britta von Koenigsegg, was a welcome departure from the smaller fascinators Victoria usually favours and it looked great on her. This shade of orange is one of the more difficult colours to wear and while Victoria she managed it well, I think the overall ensemble is just too peachy for me. Rounding out this group of European royals was Charlene Wittstock (just two months later, she would become Princess of Monaco). Her palest-of-pale bluey grey straw picture hat featured a low, rounded crown and gently waved wide brim. With her Akris coat and pearl earrings, the hat made for an extremely elegant and refined ensemble. High collared coats and picture hats can be a tricky combination but the rounded, slightly open neck on this coat and the easy movement of the hat made for such a perfect compliment. As we might have expected, the European royals wore wonderful hats to this wedding. Whose hat did you admire? 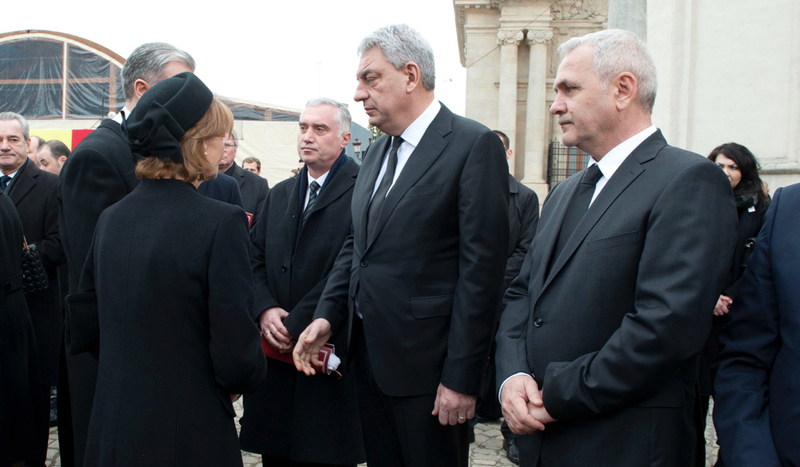 The Belgian Royal Family was joined by monarchs and representatives from numerous other royal houses for Queen Fabiola’s funeral today. Empress Michiko of Japan wore a petite black saucer hat that featured a flat fan bow and net tulle veil. Queen Margrethe of Denmark repeated her a black Karakul fur toque with feather pouf trim. 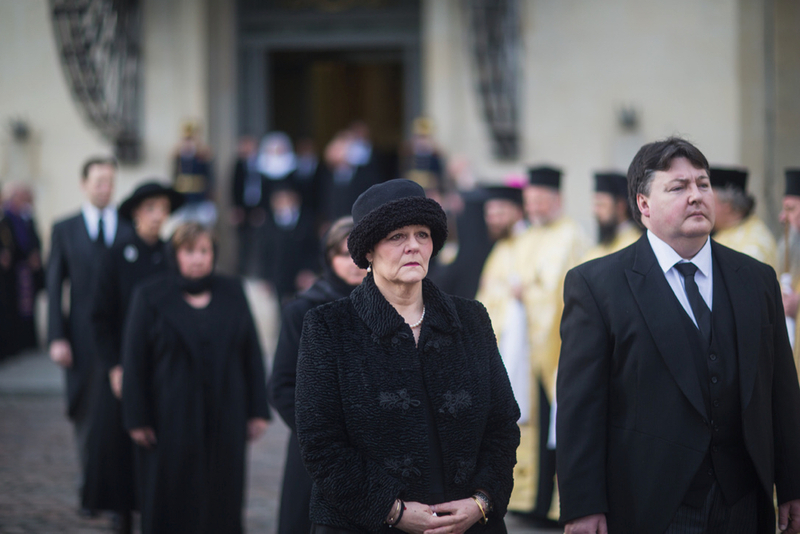 Queen Silvia of Sweden wore a black felt cloche hat with wide, folded black velvet band around the crown. 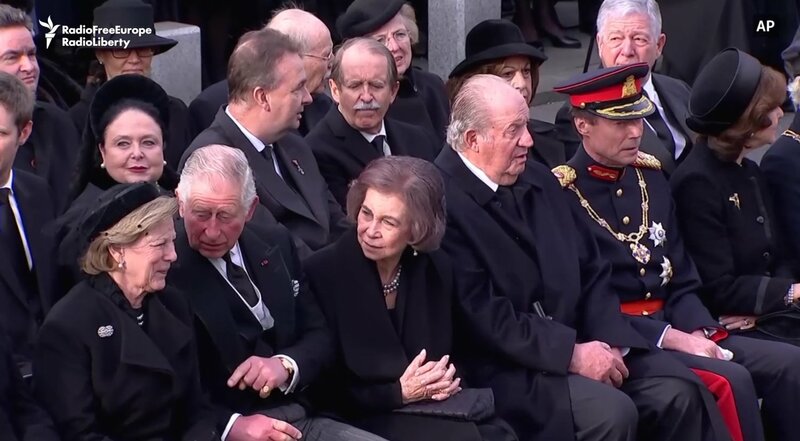 Queen Sofia of Spain wore a black pillbox which was covered in net tulle and wrapped with a band of black velvet around the outside of the hat. Princess Beatrix of the Netherlands repeated her black fur felt hat with pointed crown and upfolded felt and straw double brim. Empress Farah of Iran wore a black silk pleated turban that was interlaced with strands of metallic black straw and trimmed with a loosely woven black straw rosette. Princess Astrid of Norway, who accompanied King Harald, wore a black bumper hat. At first glance, I thought this hat and coat combination were made from the same Karakul fur but after a closer look, I believe they are made of textured wool. And finally, the Duchess of Castro wore a black calot trimmed with a silk ruffle that spanned the side and back of the hat. I think that includes all the royals who attended this event (please let me know if I missed anyone). The hats were all rather simple, but simple elegance is exactly what was required. Did any of these royal hats stand out to you today?